Ride the good roads and skip the bad? I don’t mind if I do. Folding bikes have recently piqued my interest after a few less-than-ideal situations around the world with the tandem. The most stressed I ever felt when travelling was not when I was getting hassled in the street, when I ran out of water or when the distance to the next town seems impossible. 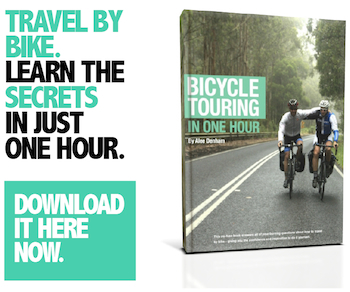 No, it’s when I have to put my bike on other forms of transport. My uneasiness lies within the unknowns of bikes on transport: the chance I won’t be able to travel with my bike because of its size, the additional costs associated with driver demands, and whether the bike will be damaged in transit. If I was going to choose to take a bike on mixed forms of transport, it had to be folding. But I did have a few concerns. 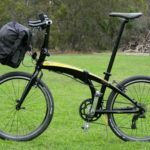 Will a folding bike be less enjoyable to ride? Will it be durable enough for the demands of touring? 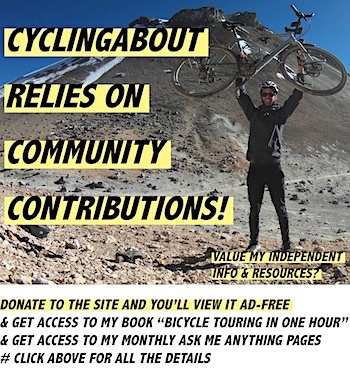 Will it be harder to ride long distances, up great mountains? Will my 6ft6/198cm frame even fit on a folding bike?! Tern have provided me with a 24” folding bike to test out on the Mae Hong Son loop in Thailand. 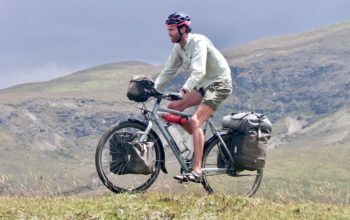 The numbers are almost enough to put most people off trying it on a regular bike, let alone a folding bike: 660km, 13000m of climbing and 4000 bends. I will be using alternative forms of transport before and after the big ride to test how my stress levels sit through the transit process. I will also be assessing how a folding bike changes ones travel experience for better and for worse. This is going to be fun! 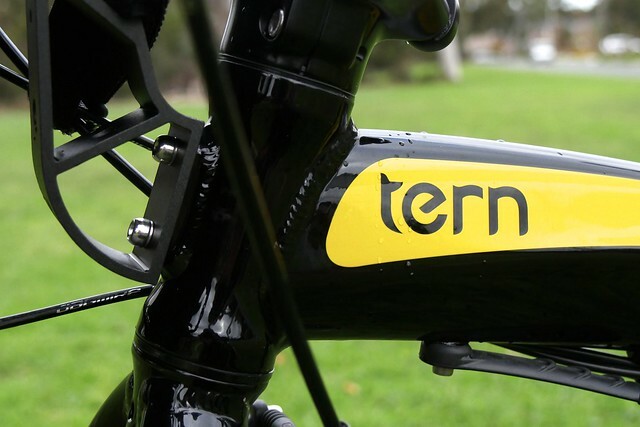 The first thing you notice with the Tern is that the frame and components are of a high quality with an outstanding attention to detail throughout. The shape of the hydroformed aluminium frame is sleek and modern, the welds are smooth and the paint is a bright gloss with a mild pearl through the yellow. 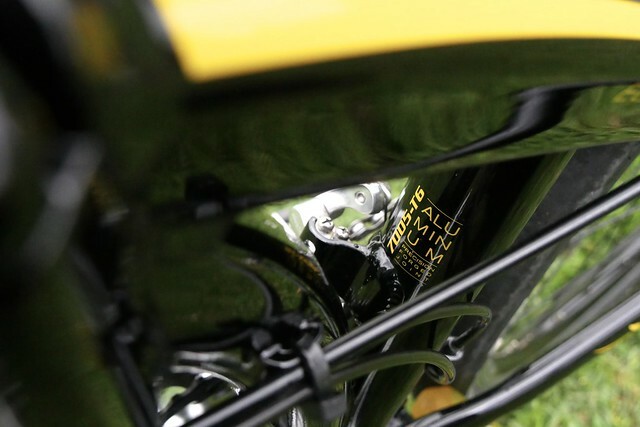 The frame and handlepost clamps are a focus point given the nature of this bike, and they don’t disappoint either with a lovely shape and finish. The Physis handlepost is definitely a standout – it’s forged from a single piece of aluminium and has a brushed look. I’m told only a few factories around the world can 3D forge a complicated component like this. The seatpost is over 600mm long which suits my outrageously long legs just fine (I actually can’t get the seatpost high enough on the 20” version of this bike, the Verge). Biologic saddles and grips are ergonomic and turn out to be particularly comfortable, even without cycling shorts or gloves. The Syntace adjustable stem is a beautiful piece of engineering – just undo the two bolts and set it to whatever stack and reach you like. SRAM X7 MTB gearing is employed offering super snappy gearshifts; in fact, when you first test ride the bike this is one of the most noticeable things about it. 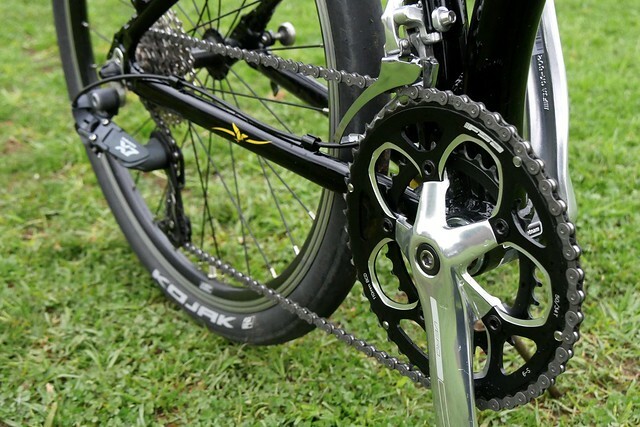 The gear range is impressive, with a compact road crankset (50-34t) at the front and a 11-32t cassette at the rear. This translates to 26 gear inches in the smallest gear and 111 gear inches at the top, which allows me to spin happily at below 10km/h, right through to 60km/h! That should be enough to get me up and down the 20% gradients in Thailand, although if I was carrying more gear on this trip I might want lower gears, perhaps a 34t at the top of the cassette. The brakes are as good as it gets for a v-brake. It is obvious that the hardware such as the cable, noodle, housing and pads are high quality. As a result, the braking is super light with nice modulation at the lever. The wheels are the weakest link on the Eclipse as they’re a tad heavy for a 20″ wheel set. You might have heard the phrase, “strong, light, cheap – pick any two”, well these wheels are affordable and durable. If I were designing the Eclipse to this price point, I would too preference durability over a lighter weight. 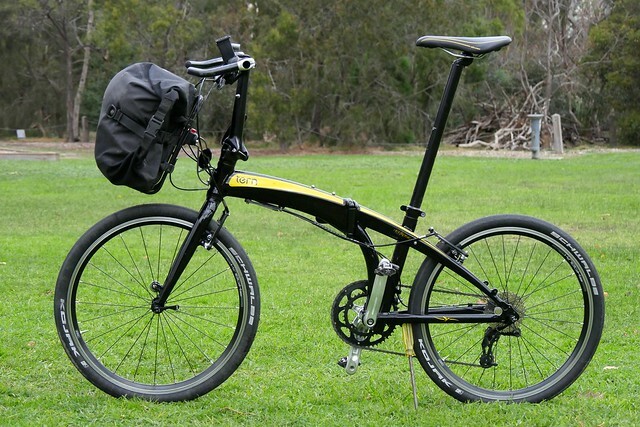 Speaking of weight, the bike weighs in at 12.5kg which is respectable for a folding bike of this size and price of US$1250 (co-incidence that the weight and pricing numbers are the same?!). The handlepost and clamps are really well-made on the Eclipse. 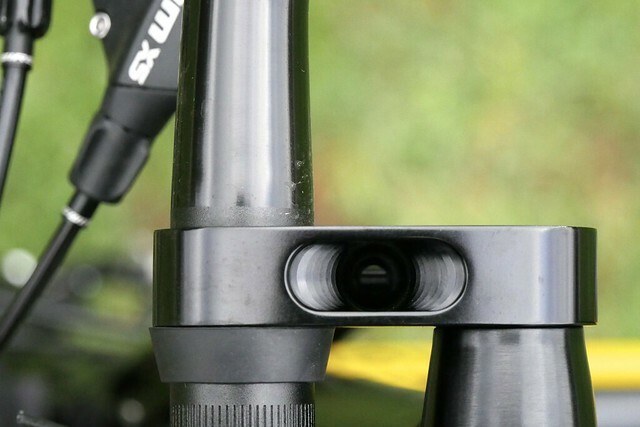 The Syntace adjustable stem is a beautifully-machined component. 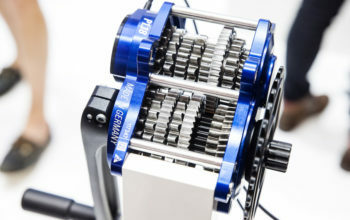 The Tern Eclipse P18 comes with a Sram X7 drivetrain that shifts impressively. The Tern’s wheels aren’t particularly light, but they seem durable. The Eclipse has exceeded all my expectations of a folding bike. Having spent some time on Bromptons and various budget folders, they simply do not compare in terms of performance. The main reason: frame stiffness. There are minimal losses in the handlepost, frame and seatpost, which results in the feeling of a bike with a much larger frame structure. In fact, I’ve ridden regular bikes that are less stiff! Given the seatpost is so long, there is a good amount of vertical flex to smoothen out the road too. 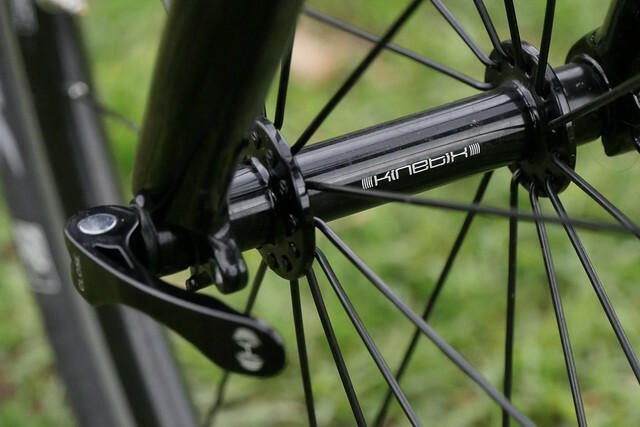 Large 24” wheels (for a folding bike) contribute significantly to the feeling of a regular bike, rolling quite well through depressions in the road. The slick and wide Schwalbe Kojak tyres are fast, making the bike super nippy around the streets. The wide range and number of gears makes riding any road very easy. Just pick the right gear for the conditions and you’re good to go! This is no 3-speed city bike. 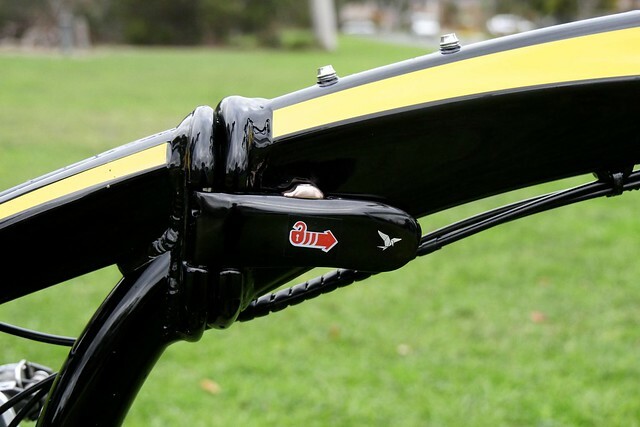 The Tern Eclipse frame clamp is well-made and offers stiffness to rival a standard bike frame. 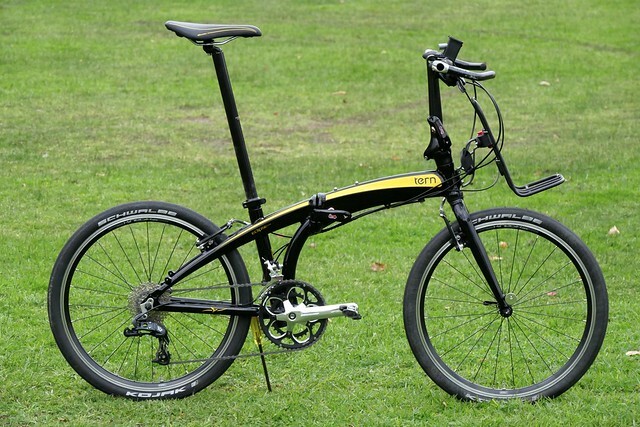 The Tern’s 7005 aluminium frame appears to be manufactured exceptionally well. You can fold the Tern in about 10 seconds. The Tern Eclipse folds in 10 seconds. How do you carry luggage? Given the light load I need for Thailand, I’ve opted for the Tern Kanga rack in combination with an Ortlieb Backroller Plus pannier mounted sideways. The pannier clips on very securely to the Kanga, so I have lots of confidence it won’t fall off. 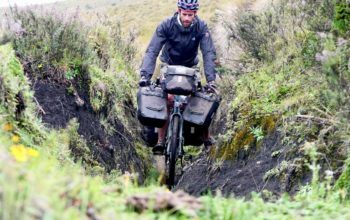 When I take the bag off, I take the Kanga rack with it –the Klickfix system is the quickest way to get the bag on and off the bike. The best thing about this setup is that the weight is mounted to the frame socket, rather than the fork or handlebar. I’ve discovered that the weight here doesn’t affect the bikes handling, including riding around corners with no hands! It’s a great option if you have less than 7kg with you. The only issue with the Eclipse/Kanga rack combo is that bags sit high, so you can’t carry anything tall or your luggage will hit the handlebars when turning. 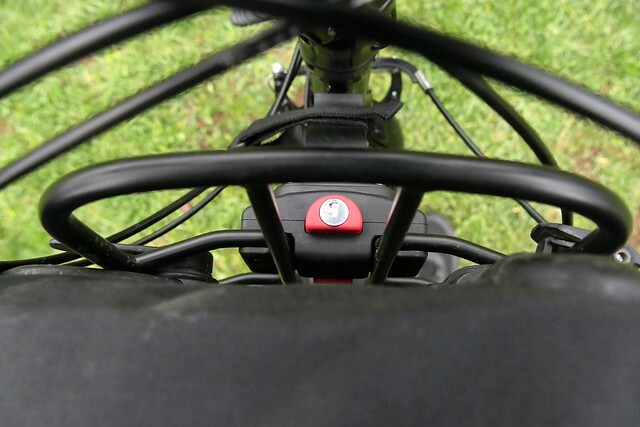 The Tern Luggage Socket is an excellent place to carry a light load. The Kanga rack mounts very easily to the Luggage Truss via a Klickfix system. 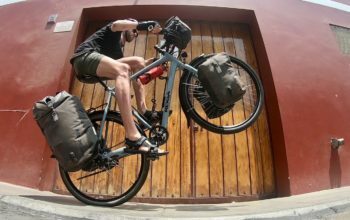 The Tern Eclipse handles really well with a 7kg load on the front. How do you make it fit someone tall? The Eclipse is only available in one size, which is great if you’re of average height, but not great for me. The seat height is fine, but the seat-to-handlebar reach is a full 15cm shorter than what I use on my mountain bike. That’s fine around town, but may be a concern on a long day in the hills. 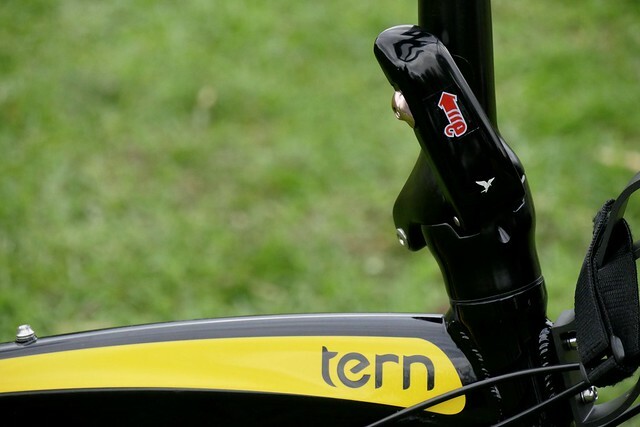 Tern bikes don’t use a regular stem system, so there is not a lot of options in that area. I’ve decided to use the longest bar ends I can find to stretch out the reach up to 20cm! Left: Cycling in the grips. Right: Cycling at the end of the barends. Barends are the quickest and easiest option to fit. The barends I’m currently using are from a 1990 Trek mountain bike, but I have some super long Procraft iGrip XLs (20cm) on their way from Germany. Other long barend options are made by TransX, RavX and Profile Design. I’m looking forward to putting the bike through its paces in Thailand. I’ll try and get it on to as much transport as possible to discover whether it changes the way I travel with a bike. The cycling loop I’ve picked is super hard, so it should push the Eclipse close to its limit. 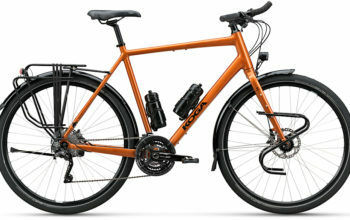 Will the Tern Eclipse be as capable as a standard touring bike? I’ll find out soon.